Residents and tourists at a well-known apartment complex in Playa del Inglés are at a loss to explain why dozens of formal complaints against a man who has made their lives a misery with loud music, constant calls to Muslim player and even recordings of speeches by Adolf Hitler have failed to produce a solution to their nightmare. 22.10.2015 - Local media have highlighted yet again the plight of the long-suffering occupants of the Europa Apartments, where over 30 official complaints have been lodged to police and the courts in a bid to have the anti-social behaviour ended. According to some reports, the neighbour from hell has prevented others in the complex from relaxing during the day and sleeping at night for approximately 18 months and his behaviour does not end there. One resident, Wendy Thomas, posted a comment on Island Connections’ Facebook page stating “I live in the complex. It's not just the music. He has parked cars in the car park blocking the fire engine spaces ... and still nothing is being done”. Some believe the man is suffering from mental health issues and is convinced that the Europa Apartments have been the scene of several murders by paid hitmen. 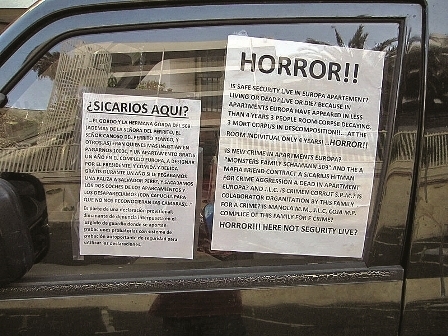 Cars parked in the complex regularly get covered in written rants in several languages placed by the man but despite the repeated requests for intervention by the authorities in San Bartolomé little has been done. Tour operators have also formally complained to the police and the local Tourist Board that they have to re-accommodate holidaymakers constantly due to the noise blaring from the man’s balcony at all hours of the day and night. Produced with news.CMS in 0,0693 seconds.